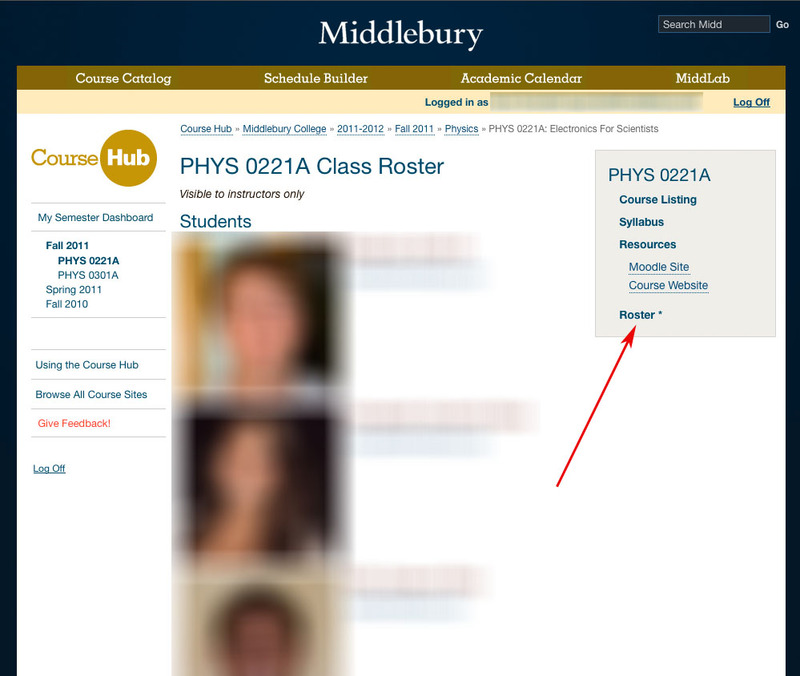 This entry was posted in Midd Blogosphere and tagged Course Hub, Curricular Technology, directory, LIS Staff Interest, Middlebury Community Interest, Web Application Development on September 22, 2011 by Adam Franco. Updated the class photo roster application to work with the new class-group structure in the Active Directory. You will now see separate lists for instructors, students, and audits for each course. Internet Explorer 7 users saw a notice on our homepage about a script taking too long to load. The IE 7 rendering engine has problems displaying over 100 stories on our homepage, so people using that browser will now see a smaller, random selection. If you’re using any other browser you’ll still see all the stories. We’ve switched back from the OSMF player to FlowPlayer temporarily for videos. The OSMF player requires the user to have Flash Player 10 and the distribution image just includes Flash Player 9. We’re going to add a prompt to the OSMF player to let people know they need to upgrade, then put it back in production. Custom splash images now work in Drupal videos. To add a custom splash image to your video use the [video:url image:url] syntax. We’ve removed the Banner Web Scout which provided pseudo-load-balancing between the two BannerWeb servers through GO. All of the GO shortcuts for Banner now go directly to the primary server with no intermediate steps. We’ve redesigned some aspects of the MiddLab theme to make the site easier to navigate and provide more space for project content and larger video players. Watch MiddLab next week as many new projects from the Spring Symposium will appear. This entry was posted in Midd Blogosphere, video and tagged directory, Drupal, Enterprise Applications, go, MiddLab, Web Application Development, ★ The Essentials on April 22, 2011 by Ian McBride. Is your contact information up to date in the College Directory? Need to add a new picture – or update the one you have? If so, stop by Circ – I’d be happy to take your picture and show you how you can upload it to the College Directory. It’s easy and quick! Privacy settings can be adjusted to allow your picture to display to the world or only to the campus. Our new web pages go live at the end of this week – is your personal contact information ready? This entry was posted in Uncategorized and tagged college directory, directory, photo on February 1, 2010 by Elin Waagen.